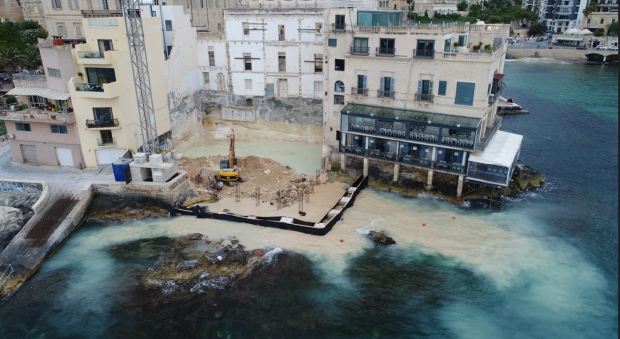 Works at the construction site in Balluta currently being developed by the Stivala Group were temporarily stopped by the Environment and Resources Authority (ERA) on Wednesday as they once again started polluting the sea. A month ago, similar problems were reported by the Times of Malta. Five people from the ERA are currently on site to evaluate what happened. Stivala Group managing director Michael Stivala said the problem sprung up a month ago when the group realised that sea water was seeping into the site from below the surface through cracks in the bedrock. After discussions with the ERA, different measures were taken which worked for a month but the problem started all over again on Wednesday. "We are now on site with five people from the ERA and we are putting more barriers in to see what measures can be taken to stop the seepage." Mr Stivala pologised to the public for any inconvenience caused. These photos of the pollution were taken on Wednesday by eNGO Żibel Cleanup Group to show that more needed to be done to protect the bay. In a statement later, Partit Demokratiku called for higher standards in the construction industry. The lack of adherence to existing health and safety regulations, it said, was obvious. "There have been numerous cases of dust and pollution and accidents narrowly avoided as the construction industry surges on ahead at a frenzied pace. "Just a few days ago, a truck knocked down an arch of historical value, apart from the wall of a private residence, while driving wrong way down a narrow street in St Julian's," it pointed out. The quality of life of Maltese and Gozitans continued to be affected as little regard was given to the proper procedures which needed to be in place to prevent collateral damage. The party reiterated the need for quality over quantity, and for a sustainable and ethical economy which prioritised the wellbeing and the needs of residents and citizens over those of the powerful lobbies.